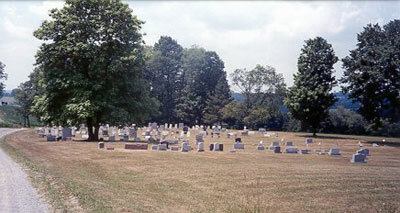 Pringle Hill Cemetery was created sometime in the earlier years of the 19th century by many of the local families. It is supposed that because the Pringles outnumbered the other families that it was called Pringle Hill. At one time there was a church built on the property, designed and built by the Dopps, with the help of the entire congregation. When the congregation dwindled, the church was closed, vandalized, and finally torn down. The earliest grave marker at this cemetery is that of Philip Pringle, who died in 1841. From Rte. US-22 heading east, turn right onto Rte. 160 South. Turn left onto Fairlane Rd. which will turn into Evergreen Rd. Turn right onto Gates Hill Rd. Turn left onto Pringle Hill Rd. The cemetery will be on the right side of the road.